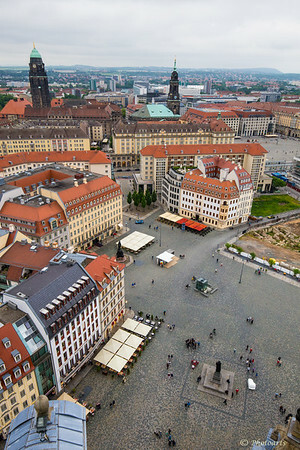 Great aerial views of the historic city of Dresden, Germany, as viewed from the top of the dome of Kuppelaufstieg Frauenkirche Cathedral, hide the secrets of the city that was destroyed in WWII and rose from the ashes to shine again! Nice shot to show the revival of the city. Wonderful view of Dresden ! !